Our main service each Sunday morning is a Sung Eucharist taken from Common Worship Order 1. We celebrate God's presence in our everyday lives, bring to God our hopes and fears, seek healing and wholeness, and find strength and encouragement to renew our commitment to work for justice and peace in the world. This worship is the focus of our shared life. Lay members of the congregation contribute during the service: reading the epistles and psalms, leading prayers of intercession and assisting with the distribution of Holy Communion. Communicant members of other Christian churches are welcome to receive communion or, if they prefer, to receive a blessing. To indicate you wish to take communion, simply extend your hands when at the communion rail. Baptised children and adults can be prepared to receive communion in a short series of classes. 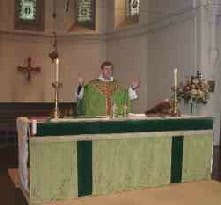 Our page about The Eucharist will tell you more about the different parts of this service. 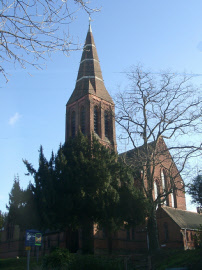 After the Sunday morning Eucharist, those who wish to can meet in the church hall for refreshments and a chat. From time to time, we also have a sales table , the proceeds of which go to charity. We want to include everyone in our worship of God at the Eucharist. Toddlers have a selection of toys to occupy and amuse them in the south aisle. Happy infant sounds lend joy to the occasion of worship, but anyone who needs to soothe a fractious child can retire to the vestry for part of the time. The service is piped through via a loudspeaker, so you will not miss any of the service. The children from Young Matters, our Sunday School, join us in time to receive a blessing at the altar when others receive communion. Our All Age Eucharist is held on the third Sunday of the month. This inclusive act of worship is centred around Holy Communion. This is the first service on Sunday and is said. It is a meditative service with readings, a short reflection and communion. Once a month we use the Book of Common Prayer for this quiet act of worship. On Thursday at 10 am there is Holy Communion. This is a quiet and prayerful service, which some elderly members of our congregation find easier to attend than the earlier 9.30am service on Sunday. There are also services for special occasions such as Ascension, Ash Wednesday and during Holy Week. Our Prayer Group will pray for particular individuals or situations, or by arrangement will pray with anyone who wants this. There is generally someone available after the Sunday morning service to pray in the Lady Chapel on an individual basis. Names given to the vicar can be placed on the prayer section of the newsletter. There are regular House Groups during Lent and an on-going group could be arranged if a sufficient number were to be interested. Members of St Matthew's also join House Groups of Bushey and Oxhey Methodists and Sacred Heart.